Pupils in England who fail to get at least a grade C in GCSE maths and English will have to continue studying the subjects until they're 18. It's thought the change could affect more than 250,000 teenagers. The government says it will help British businesses, as well as young people's chances of getting a job. 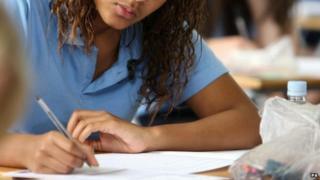 Until now pupils have been able to drop both subjects at the age of 16 without having gained a qualification in them. Many would never study these subjects again, and some employers said that this means too many young people lack skills needed for work. Last year, there were more than 250,000 19-year-olds without a C grade in English and maths. In a separate move, the government has raised the leaving age to 17 from this year, and from 2015 it will rise again to 18. This doesn't mean you have to stay in school past 16 - but that teenagers in work would also need to keep learning and training. So pupils who left year 11 in summer 2013 will need to continue in education or training until at least the end of the academic year in which they turn 17. Pupils starting year 11 or below in September 2013 will need to continue until at least their 18th birthday.